All Replies on Is this tote and knob set rosewood ? Is this tote and knob set rosewood ? 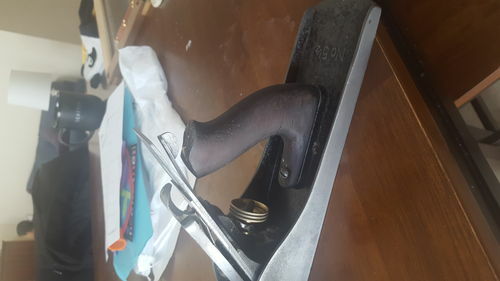 Some plane makers also used Mahogany instead of Rosewood…. There are many different kinds of rosewood. The old growth original Brazilian was the darkest I believe. I really can’t tell the difference, but east Indian is dark as well. 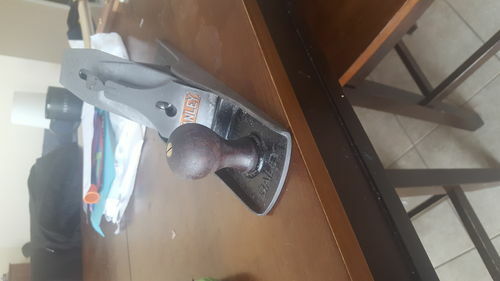 You will find several different kinds on stanley planes, especially in the later years. As best as I can tell from a photograph it looks like rosewood. BLO will almost blacken it at times. It does appear to be rosewood, a lot of Stanley handles appears to be made from burls so grain patterns and color shades can cover a wide spectrum of color and grain patterns. Try clear shellac and you will know if it’s rosewood. -- Ben, South Carolina, The creation of sawdust and shavings is my greatest skill in the work shop! Pretty close to what they looked like without the green paint. I do want to put some lacquer on there to give them a bit of a sheen, but I have to wait a few days for the danish oil to dry. I expected rosewood to be…well…rose colored under the finish. I guess I learned something! FYI, rosewood got its name because of the floral aroma when cut and worked, not the appearance. Any time I’ve put an oil finish on old rosewood, it goes almost black. What I now do to avoid that is sand the rosewood up to a very high grit (usually 1500 or 2000) and then coat with just paste wax. It keeps the color better and feels good in the hand. Doesn’t give a lot of sheen or protection, however. Ditto. I find 600g abranet is just right.